Bratkartoffeln with Bacon is a great dinner meal idea. The German fries recipe is great with leftover boiled or roasted potatoes. Bratkartoffeln are German pan fried Potato Fries. 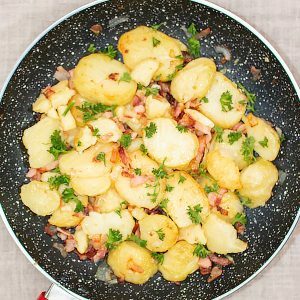 Boiled potatoes are cut into thick slices and pan-fried with butter and bacon fats until crisp. This is a very common dish in all German-speaking countries, which includes, Germany, Austria, and Switzerland. Braten means to fry and Kartofffeln are the Potatoes. Hence the name German roasted potatoes or German fried potatoes. However, german fries will be known under another name in different places because Bratkartoffeln is an upper german name. Bratkartoffeln are prepared mainly with boiled leftover potatoes. Potatoes are a very important ingredient in central Europe and it’s a staple. We prepare all the times meals with potatoes and that’s when we have leftover boiled potatoes waiting to be used. You can also boil potatoes and use those instead. The potatoes are peeled and cut into thick slices. I also love to add bacon, so I cut that into small slices and bits. Use butter instead of oil to add extra flavor to the dish! Sliced onion, bacon and sliced potatoes are fried over medium heat until the potatoes are getting crispy. It’s a very straight forwards cooking process and the Bratkartoffeln recipe can be prepared easily and quickly that way. 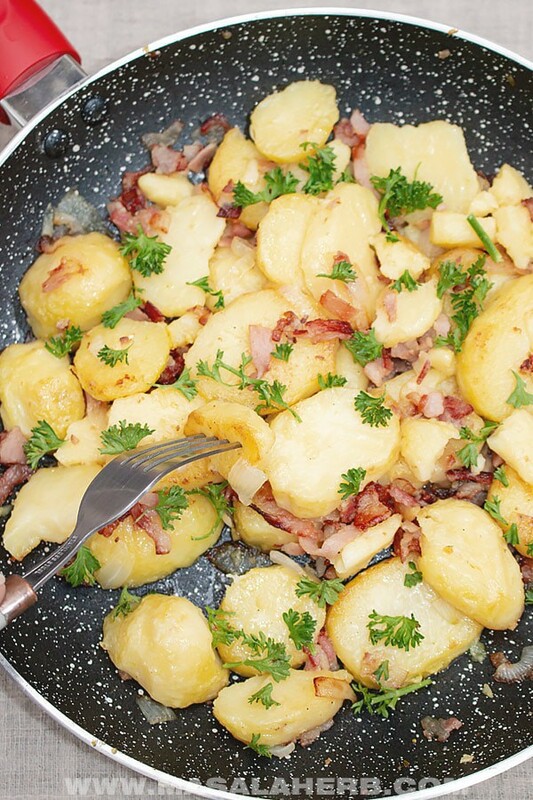 Bratkartoffeln can be prepared without anything extra by just using potatoes. That way you can serve your vegetarian german fries with other meals such as a Schnitzel. I always add onions and bacon to my quick fried potatoes because it tastes better. I serve this as a meal on its own. Otherwise, prepare a skillet with potatoes and eggs. This is commonly done in the alps and it’s a meal on itself as well. These are also known as cottage potatoes because they are common Apré Ski food. You can also sprinkle some grated cheese over the German potato fries. If you want a Vegan Bratkartoffeln, then just switch the butter with vegetable oil or olive oil. Another idea is to add fresh herbs such as thyme to the potato fries, as in this skillet potato recipe just with a German style twist. Crispy Bratkartoffeln - German fried potatoes cooked in a skillet. This is your quick and easy dinner meal solution. Tastes great and it's a budget meal! Use leftover cooked potatoes to prepare this dish within 20 minutes! Boil your potatoes soft. Let them cool and peel them. Cut your potatoes into thick slices. We need thick slices to fry them or it will get messy. Add in the onion slices and fry them soft. Continue to add in the bacon slices and cook until they change color and they look semi-done. Now add the garlic and mix it in. Then season with salt and black pepper and stir cook for a minute. Now add the potato slices. Arrange them in the pan so that they all fit. Cook the potatoes on all sides on medium heat until crisp and done. Garnish your Bratkartoffel with fresh parsley and serve warm on its own or as a side dish with Schnitzel and Sauerbraten. Use Cooked leftover potatoes to prepare this dish within 20 minutes. IT will save you time and you don't waste food. Dear Reader, have you ever had Bratkartoffen? 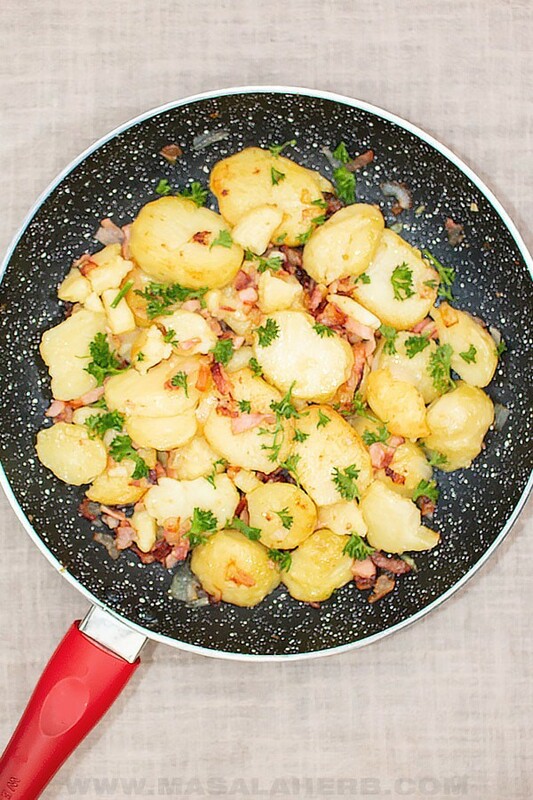 Hi, this may be interesting you: Bratkartoffeln with Bacon - German Fries Recipe!